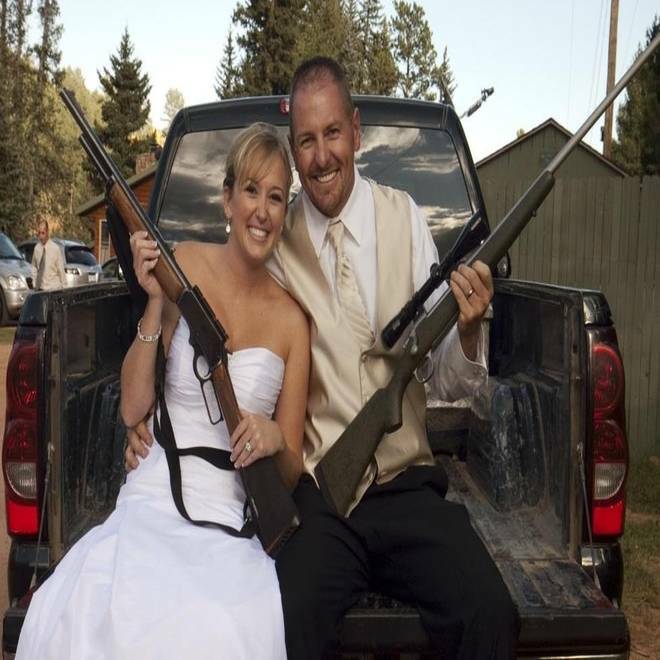 Nate Zelinsky, pictured on his wedding day two years ago with his wife, Mandi, has a collection of 20 guns. That’s 19 — and 20, if you include the 9-millimeter weapon carried by his wife, Mandi. On the plains below, in a suburban home not far from the site of Friday’s Aurora theater shootings, certified public accountant Stephanie Lidke watches her infant daughter while she lists her guns: there are at least 10, she says, including the two .40 caliber pistols that she and her husband, an HVAC technician, are permitted to carry and conceal. These are two faces of America’s gun owners, and they happen to live in Colorado. They span white collar, blue collar — and, in Zelinsky’s case, camo collar. 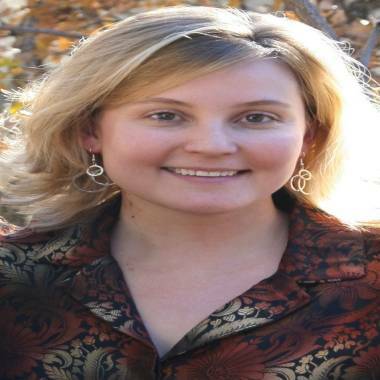 Stephanie Lidke, an accountant who lives near Aurora, Colo., and her husband own at least 10 guns. And now, interest in guns is expanding — swiftly. In the three days following the Friday's mass shooting at a midnight showing of "The Dark Knight Rises," nearly 3,000 Colorado consumers were approved for gun purchases after passing instant criminal background checks — 39 percent higher than Colorado's rate of firearm purchases during the two previous weekends, according to the Colorado Bureau of Investigation (CBI). "Foot-traffic wise, we've had a lot more people in the store who are interested in looking at what’s out there, considering their options," said Brad Lightner, general manager of the Firing-Line, an Aurora gun retailer that offers more than 1,500 firearms plus a practice range. "Many are here for home defense." For some Americans who have never owned guns — or who haven't fired or even touched one — there is a deep cultural chasm when it comes to understanding why anyone would seek to possess a single firearm, much less 10 or 20. That gap, widened as well by sharp philosophical and political differences, is hardly a new phenomenon. But ask Zelinsky or Lidke to break down the various facets of their ample gun collections and you'll hear rational purposes that stretch from sport to safety to a simple appreciation of vintage handicrafts. "I have a .45 (caliber) handgun and a shotgun for home protection," Zelinsky said. "I hunt with a long-range rifle, a 300 Ultra Mag. The biggest one I carry in the woods, for bears, is a .454 Casull (handgun). The shotguns are probably the most important becauseI have many more situations with wildlife than I do with people. Every single night, we have this young bear that's been tearing up the neighborhood. When I leave for work, probably 50 percent of the time I walk to my truck, it's me and the bear, and we come to terms every morning." Down in the city, Lidke explained: "We have 12- and 20-gauge shotguns for bird hunting plus a 30-aught-six (rifle) and a 7-millimeter (rifle) for large game — those are tools to help feed our family. We have a Taurus .41 (magnum revolver), which is our bear gun for protection in the woods when we're backpacking or camping. We have antique guns handed down from my husband's great-grandfather, all hand-carved from sitting around a fire at a hunting camp." The two .40-caliber Springfield XD handguns that Lidke and her husband are permitted to conceal and carry "are more for personal protection. I had a little girl in February so it just became even more important to us to protect her, if necessary." The need to pack extra security seemed to be feeding the recent sales spike in Colorado, according to firearm retailers like Lightner. The day after the midnight cinema shootings that left 12 people dead and more than 50 people wounded, 1,216 Coloradans were approved for gun purchases following background checks — 880 more than the number approved on the same day one week earlier, according to CBI data. The Firing-Line also offers classes that help qualify gun owners to apply for conceal-and-carry permits in Colorado, one of 49 states that allow guns to be covertly toted by licensed individuals. "Sign-ups indicate we'll have a few more people taking the training course," Lightner said. "If you’re going to carry concealed on the streets, that is another level of responsibility. It’s a big step. Obviously, I wouldn’t recommend it for everyone and we don’t. But for somebody who is interested in being able to defend themselves if an emergency should arise, that will give them at least some of the tools to do it with. "For myself, I don’t carry 100 percent of the time. It’s a problem — I mean as far as comfort goes. When you go certain places, it’s not practical. (Colorado movie theaters don't allow permitted carriers to bring guns onto the premises). For most of us, we don’t want to be heroes. In fact, you don’t even want to put yourself in that position. But I’ll tell you what: if you are in that position, for whatever reason, you can try to better the situation." Long before the mass tragedy in Aurora, gun sales were soaring nationally. In 2011, federal investigators performed a record 16.4 million instant criminal background checks on potential gun buyers — 14.2 percent more than 2010, FBI figures show. Many gun owners, including Zelinsky, sniff the strong scent of political panic in that retail rush — namely that if President Obama is elected to a second term, his administration may push legislation to limit or restrain firearm ownership. "I would say 80 percent of the people I know own way more (firearms) than me," Zelinsky said. "I mean, you walk into their gun-safe rooms or their garage, you really think they’re going to some kind of war. But it’s not for crazy reasons. They’re just worried it’s not going to be around. "Get them while you can, buy them while you can, that's the thinking behind it." And that fear, Zelinksy says, has truly revved the market for used guns — often weapons without attached ownership records, meaning authorities don't know who currently has them or where they're located. "People just don’t want anything with paperwork so if there ever was a crazy situation where somebody is saying: 'Hey, we’re taking away the guns,' (many used-gun owners) want something that’s non-traceable," Zelinsky said. "It’s unbelievable, the sale of used firearms just in the market, and not retail. You can have an older, beater pistol and you can sell it (privately) for more than what it costs on the shelf just due to the fact that you have no paperwork behind it."